Mexico has a lot of well-known problems. Drugs. Poverty. Corruption. And on the corporate side, low-levels of production outside of the major multinational owned manufacturing firms. But despite the campaign rhetoric to build a wall and to knock Mexico down a peg in a NAFTA do-over, there is one problem our neighbor does not have: beating every single equity market in the Americas to a pulp. 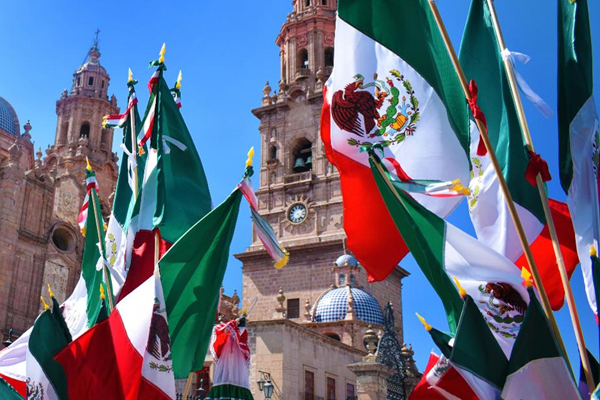 For investors, Mexico is great…again. After a slight lull in affection back in April, the market has rediscovered Mexico now for the past two months. The trend is seen continuing until the fourth quarter. Mexico was already great at the end of last year on into January for bond investors. They bought local currency Mexican government bonds when the peso fell to its lowest level on record, around 22 to the dollar. It’s now 17.17 to the dollar. Those investors have gained at least 14.8% since January on the currency alone. The second-place currency in terms of strength against the dollar this year is the Brazilian real and that’s only gained 3.5%. Morgan Stanley says the Mexico bull run is not over. Economist Luis Arcentales of Morgan Stanley in New York says the mood has markedly changed since Trump first won the White House. “Besides the great food and the awful traffic, I did sense a shift among local investors who seemed much more constructive about Mexico after having been quite cautious because of a whole host of factors ranging from domestic politics to concerns about protectionism,” he says. Last week’s news on upcoming NAFTA revisions helped strengthen Mexican markets seven more. Many of the elements added, such as beefing up local content rules for manufacturers, protecting intellectual property rights and labor provisions were included in President Obama’s failed Trans-Pacific Partnership negotiations, and both Mexico and Canada agreed to make those concessions out of concern that the U.S. would bail and turn to Asia instead. NAFTA renegotiations begin on Aug. 16. For Arcentales, barring the proposal to scrap the Chapter 19 rule in NAFTA on anti-dumping and trade duty matters in favor of the U.S., most Mexico watchers today think NAFTA just gets better, not worse. Mexico has benefited from better coordination between the federal government’s two most important entities: oil firm Pemex and the central bank of Mexico, Banxico. Fiscal and monetary policies are tighter, energy reform that allows for greater foreign participation (meaning less spending for Pemex) has been a success thus far, and the central bank managed to protect the currency well, with ample reserves in a severe downturn. Morgan Stanley strategists say they see “a window of opportunity to express a bullish view” on Mexico at least until their presidential elections next summer. Morgan analysts expect volatility to pick up in the first quarter. “The story for the Mexican peso will be different in 2018,” says Andres Jaime, a strategist at Morgan. The peso is unlikely to move closer to the dollar than 17 pesos. It’s already up from 18.12 when FORBES ran its portfolio manager profile on BlackRock’s Gerardo Rodriguez in June. Next year, political uncertainty will have a bigger influence on the currency and on Mexico in general, with volatility kicking into high gear by March. “Some cheapness in the currency is a near certainty in my view, particularly in the second quarter of 2018,” Jaime says. For now, Mexico is still in the sweet spot. There’s potential for more upside. Mexico seems to be in the midst of a period of relative calm. Investors have decided to shelve politics for now, possibly until NAFTA negotiations are well under way. Or in early 2018, when party alliances and candidates are defined. The economy is facing a full employment scenario similar to that of the United States. The official unemployment rate as of June is just 3.3%, down from 3.5% for much of the year. The net labor force participation rate rose to 59.3% from 59.2% in May. Industrial production remains tepid, but that is because the statistical element is heavily weighted towards Mexico’s energy sector and construction. Mexico continues to face downside risks from public spending cuts, higher gasoline prices and slightly higher interest rates, but it has since avoided the most adverse scenarios trumped up by the media, with the help of the president himself. To date, there has been no mass deportations of Mexico’s illegal U.S. residents. Such a move would have put undue strain on Mexican public services. Many Mexicans in the United States, included undocumented workers, send money to their families in poor cities and towns across the country. That’s less money the Mexican government has to spend on social welfare, having counted on money from Mexican-Americans now for generations. NAFTA meanwhile is still firing on all four cylinders, wiping out fears that Trump would sign an executive order calling for the immediate withdrawal from the trade treaty signed in 1995 under President Bill Clinton. They’ve dodged two bullets, helping, for investors anyway, to make Mexico great again. “Mexico’s better than expected economic performance adds to 2017’s resurgence of emerging markets which is lifting global GDP growth back to potential,” says PNC Financial’s senior international economist Bill Adams in Pittsburgh. “The global economy has reached the sweet spot of the economic expansion,” he says, and within Latin America at least, Mexico is smack dab in the middle of that sweet spot.